New South Wales (NSW), located on the south east corner of Australia, is the most visited and densely populated part of the country. Its capital is Sydney Australia, as well, it is the location of Canberra in the Australian Capital Territory. 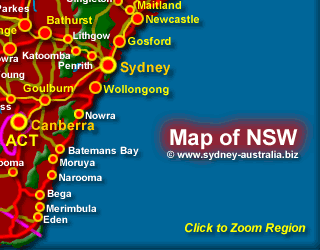 NSW is also where the first Europeans settled in Australia, in 1788, at Sydney Cove. From here, the rest of the country was progressively settled, with Hobart Tasmania, Melbourne Victoria and Brisbane Queensland being next. Here you will find beautiful coastline with sleepy villages and towns, while in the south, is the tallest mountain in Australia, Mt Kosciuszko and the Alpine National Park, with its snow capped mountains in winter. 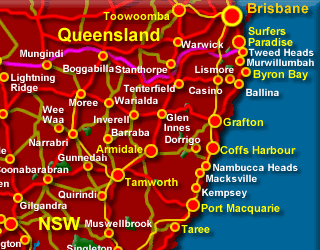 See more about New South Wales Places, Cities and Towns - NSW Tourist Guide. 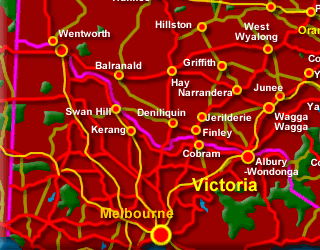 The Australian Capital Territory (ACT) with the city of Canberra, is the Nation’s Capital. See more about Canberra ACT Australia.